LeBron raised his season scoring average from a hair over 26 points a game to 26.6, a remarkable jump this deep into the season for a player already averaging such a high number. James carved up the fifth-ranked Magic defence with ease. He went 4-5 on layups, 13-20 on jump shots, 3-5 from downtown, and 14-17 from the free throw line. 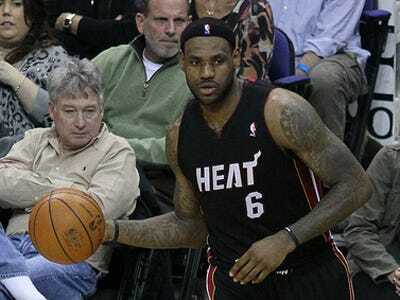 Counting the 19 points created off James’s assists, he directly accounted for 70 of the Heat’s 104 points. This was only the 11th 50-11-8 game in NBA history, and only James and Michael Jordan have done it in the last 39 years. The feat was also accomplished by Wilt Chamberlain (four times), Elgin Baylor (twice), Kareem Abdul-Jabbar (twice), and Richie Guerin. This was only the sixth time anyone’s scored 50 points against the Magic. It was LeBron’s ninth career 50-point game — all have come on the road. He has shot better than 50% in all of them. The last 50 point game came just over a year ago when Andre Miller poured in 52 points on January 30, 2010. The gap of 1,263 NBA games between 50-point efforts is the second longest in NBA history. See any stats we missed? Let us know in the comments.